The B2169 is reputed to be haunted by a phantom limousine. 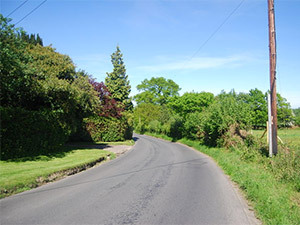 Pictured left is the road into Bell's Yew Green courtesy of N. Chadwick. Frant is a village in East Sussex, England. It lies on the Kentish border about 3 miles south of Tunbridge Wells. Pictured left is a view of Frant courtesy of Andrew Hill. Licensed under CC BY-SA 3.0 via Wikimedia Commons.